Despite being one of the first Special Economic Zones (SEZs) in China, the port city of Zhuhai has more of a reputation for being rich with gardens. 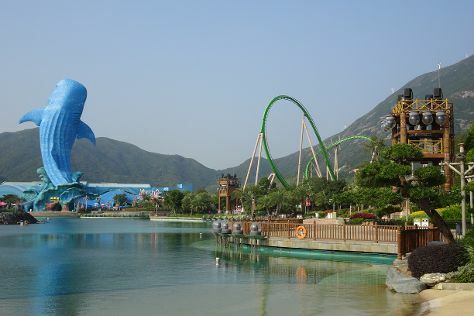 On the 26th (Wed), admire nature's wide array of creatures at Chimelong Ocean Kingdom. Get ready for a full day of sightseeing on the next day: contemplate in the serene atmosphere at Kun Iam Temple, get your bearings at Macau Tower Convention & Entertainment Centre, then appreciate the extensive heritage of Historic Centre of Macau, and finally steep yourself in history at Ruins of St. Paul's. To see other places to visit, reviews, photos, and tourist information, refer to the Zhuhai trip planner . If you are flying in from Singapore, the closest major airports are Hong Kong International, Shenzhen Bao'an International Airport and Guangzhou Baiyun International Airport. December in Zhuhai sees daily highs of 22°C and lows of 16°C at night. Finish up your sightseeing early on the 27th (Thu) so you can travel back home.